The positioning of this planet says about how we communicate, think and act. Mercury is the ruler of our reasoning and that is why is so important to know where it was when you were born. Get to know about Mercury in Scorpio. Water is the element of Scorpio (just as Cancer and Pisces) and Pluto is its ruling planet. Scorpio is the deepest sign in the zodiacs and this Mercury follow this characteristic. They dive into every thought they have and explore like the most experienced scuba diver. The knowledge is irresistible to those people. The more they know, the more complete they are. They are natural researches and develop this curiosity since a very young age. These people are also attracted to the mysteries and occult side of life. Maybe that is why they carry a rather gloomy aura of thought. They are not the type to speak everything they think. 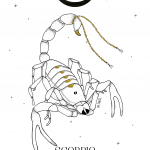 As Scorpio is the sign of make or break, either they speak exactly what they think, or they remain silent. And it is very common to plan things in secret, telling after a long time about your plans and for as few people as possible. Like other positions of Mercury in a water sign, their minds are fluid and comprehensive. They also manage to think many things at once, yet with a much deeper focus and attention to detail than those that have Mercury in some air sign. Their perception is so sharp that it is very difficult to fool a Mercury in Scorpio. They are people who pay attention to every detail of their interlocutor, from the words used to their facial expressions. And from these codes, they form the information in their brain. The water element brings the emotion necessary to balance reason. They are very intelligent and can use intuition in their favor. It is not uncommon to have insights and flashes of revelation about their life on a simple bus trip or at a groceries store’s line, for example. Mercury in Scorpio is deeply connected with the roots of what they feel and think. With them there is no extreme rigidity of thought and tend to be sensitive to others, especially if there is affection in their relationships. They have a tough way, but they will consider the consequences of their acts on the lives of those for whom they have appreciation. However, they are able to use the sensitivity to read between the lines of the other and take advantage of the situation. Mercury in Scorpio is hard to fool, but they know how to do it with others, if necessary. They are very determined and strong beings in the pursuit of their goals. Scorpio has this ability to resilience and adaptation that, in front of the obstacles is very useful to overcome and learn from them. If the teaching of the ropes has not yet been revealed, it is their job to find out what it is. Their detective mind will watch from all sides, consider all the options until arriving at a conclusion that is generally the right one. Agile and interested minds such as Mercury in Scorpio are perfect for professions in which these characteristics are essential. Like scientists looking for the cure of a disease, for example. They would also be great psychologists and psychiatrists helping to bring to the surface what is hidden and needs light to be improved.